Four Shop Organizing Projects - Slide Out Storage! Organizing a shop is very important to me and is something I always find enjoyment in. The first rule to organizing in my mind is to make dedicated “home” for what you have. 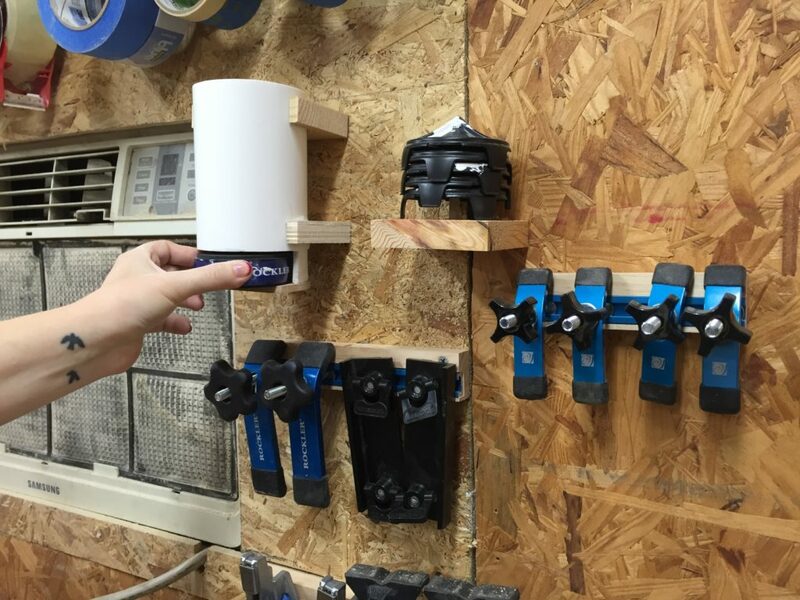 For example: If you do not have a specific spot designated for your clamps to go and then they will end up just collecting all around your shop. 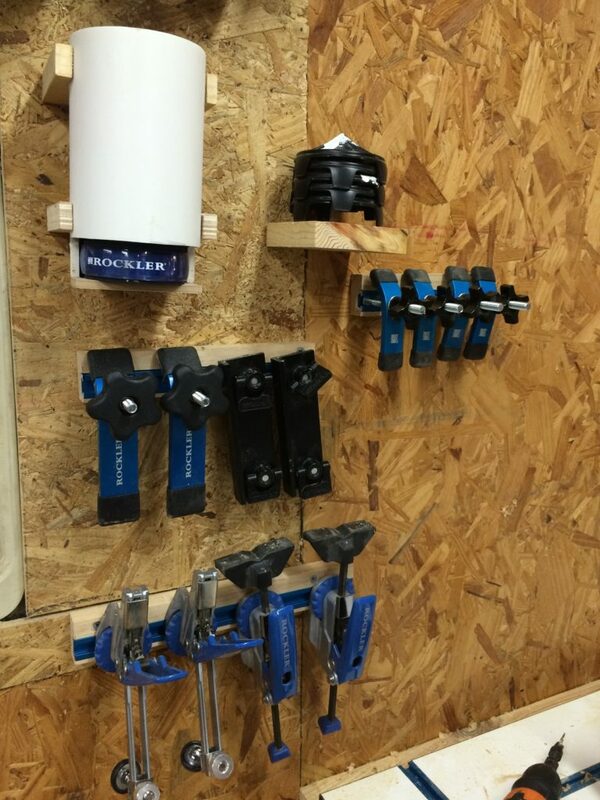 However if you make a clamp rack then you have a dedicated spot you’re able to store your clamps. I have about five or six different things laying around my shop that are in need of “homes”. This week I decided to take some time to design and build a few simple organizating solutions. When I’m making holders for something around my shop I’m constantly looking around trying to utilize as much wasted space as possible. Since I had some smaller items which needed a home, the space underneath my fold-down workbench caught my attention. 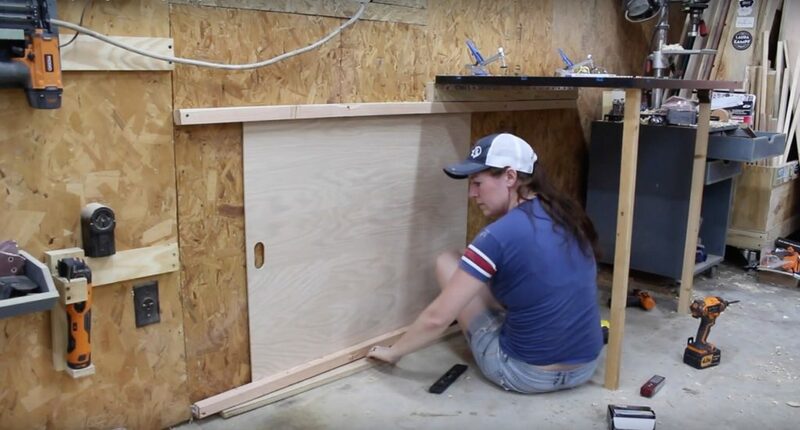 (you can find a tutorial on how I made this workbench HERE) It turns out a lot of the items I’m looking to store will fit within the few inches of space I have between the wall and the workbench whenever it is folded in the down position. 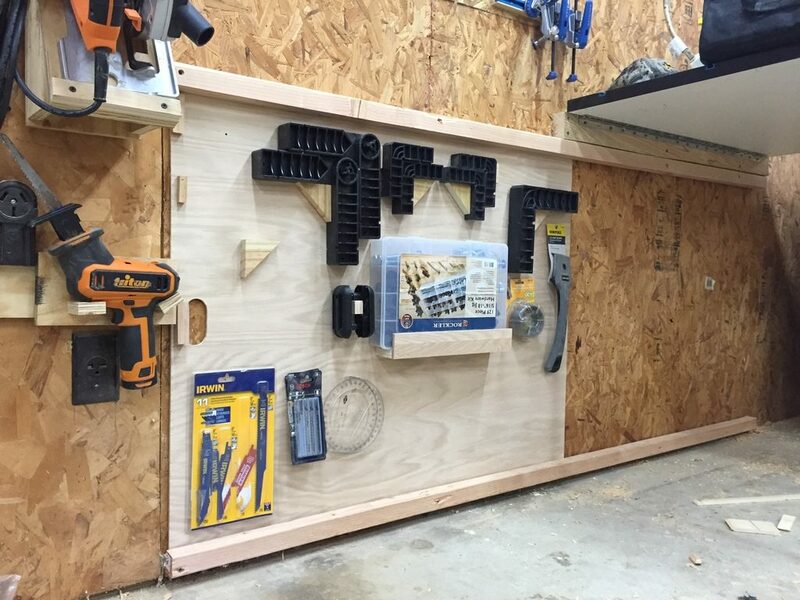 Even though I have wall space above the workbench which I could place all of these items, I would much rather store them under the workbench to utilize this space and leave the remaining wall space for something that needs more room. To make this work I needed something that slides along the wall under the workbench. This way, the items will be out of the way, and when needed, I can simply slide the storage system out, grab the tool that I need, and then slide it back into its little nest. 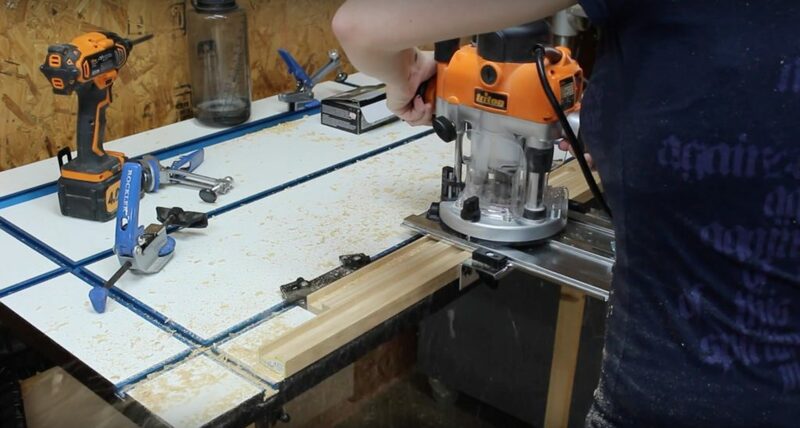 This is a great project to use up scrap wood in the shop. I made all of the small holders, grab handles, and slide rails completely from my scrap bin. I started with a 2×4 that I ripped down the middle on the table saw. I decided to fashion my sliding rails out of each half of the board. Using the tablesaw, I cut in a rabbet along one side of each board. I made this rabbet ¼” x ¼”. (You could make this go faster by using a dado stack.) With a single blade in the saw, I cut in the rabbet by moving the fence over little by little until my rabbit was complete on both boards. I tested the slot with a scrap piece of quarter inch material before moving onto the next step. Once I knew it had plenty of clearance, I moved on to mounting the top rail. I installed the top rail using a level and a countersink bit. If you do not have a countersink then use a small bit to pre-drill so that you don’t end up splitting the ripped 2×4. I used a 3” screw to go into the stud. Before attaching the bottom rail I cut my quarter inch plywood to size at the tablesaw. I then cut in a handle hole using a forstner bit. 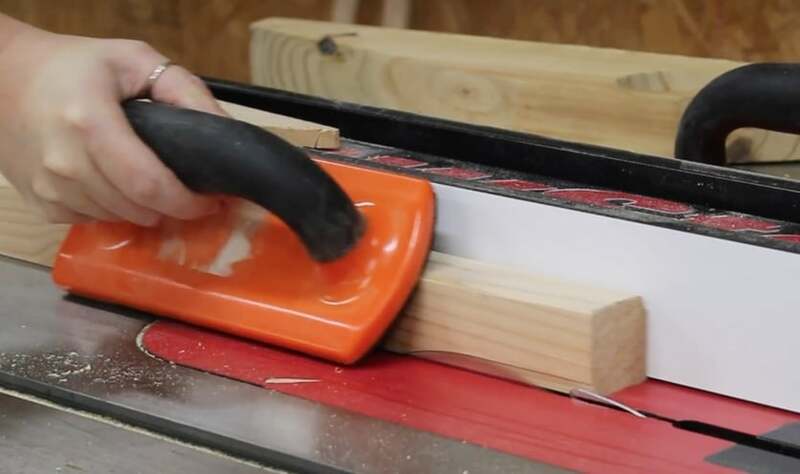 Note: if you were redoing this project I recommend skipping the handle hole because I found it much easier to glue a piece of wood to the surface so that it’s standing off the material and can be located much quicker than a through-hole type handle. Of course this is just a personal preference. With the back cut to size I placed a spacer on my shop floor and attached the bottom rail in place, again using a countersink and three inch screws. Note: I didn’t want my bottom rail resting on my shop floor so I placed a spacer under it while attaching it to the wall. At this point, I can slide the entire piece of plywood back and forth on the rails. I moved a few things out of the way so that I could remove the back and continue working with it. The items that you store on here are completely up to you. If you’re not working with limited space like I am (with my folding workbench) then the options are endless on what you can store on something like this. Also, the way that you store the items are completely limitless as well. I went through my scraps and found small pieces of wood in order to make a few small holders. For things that were in packages, I used screws in order to hang them. So figure out what you would like to store then figure out the easiest way to attach them to the board. Once I had all my holders figured out I put the board on the rails, hung all of the items I had in mind, and that’s it! I think this is great in order to use wasted space, like my case with the folding workbench but since I have to store it under/behind something I made sure to use items that are not reached for on a daily basis. That’s another rule of mine to organizing….keep the things you constantly use easily assessable. The things you don’t use all the time can be stowed in places not as readily assessable but still assessable. Bench cookies are extremely handy but I’m tired of them just lying around. I decided to make a dispenser similar to a hockey puck dispenser. Three inch PVC fit around the bench cookies perfectly so I figured out the height I needed and cut the PVC using the miter saw. In order to make a dispenser, I needed a slot at the bottom, just large enough to grab and slide out one cookie. So, I set one bench cookie down in front of the PVC and marked its height on the piece of PVC using a pencil. Using the miter saw, I plunged the blade down to about the half way point. From here I was able to hold the PVC in place using my SuperJaws while I used a hacksaw to cut down to the cut line and create my slot. I use a all-purpose adhesive to attach a small semi-circular piece to the bottom of the PVC in order to make a bottom “shelf”, keeping the pucks from falling through. I was a little impatient here and wanted to keep moving instead of waiting for the adhesive to dry. So, I pre-drilled a couple of pilot holes, then screwed the wooden shelf to the side walls of the schedule 40 PVC. For this kind of job, I would typically screw the pipe directly to the wall but since the screw heads would then interfere with an already tight fitting bench cookie, I decided to make a small “saddle” for the pipe to rest in. I found a piece of scrap ¾ and simply traced the circular profile onto the material, cut out the shape using a jig saw, and then screwed it to the wall after countersinking a hole. Note: If you do not counter sink the hole here, the screw head will interfere with the PVC. 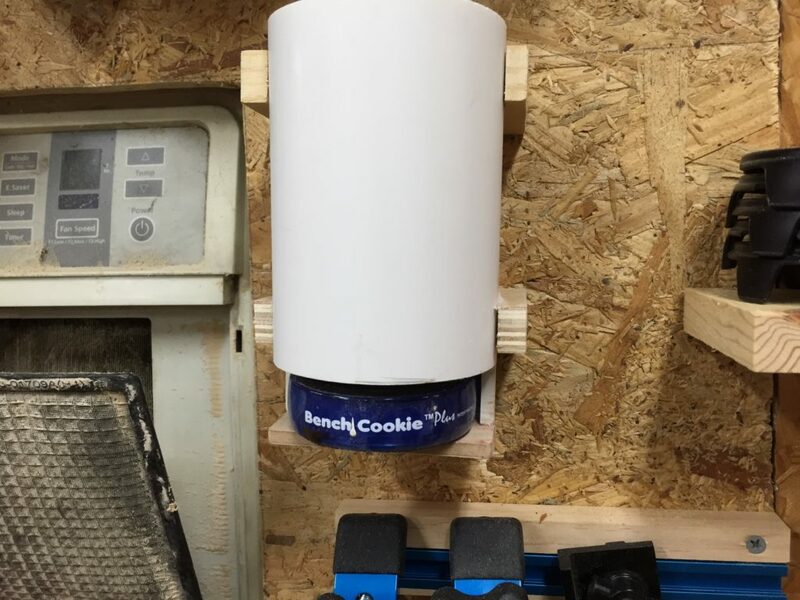 Once the glue is dry you now have a bench cookie dispenser where you can grab a cookie from the bottom and place it back into the top when you’re done with it. Storage for the attachments that go on top of the bench cookies is super easy. I cut a square piece of material just big enough for the attachments to sit on and drilled a hole in the center. I then found a small scrap that is probably a ¼” x ¼” and cut a 45 along the top to give it a small point. I put this small pin in the middle of my square material, placed the cookie attachments on top of the pin, and then slowly lowered the pin through the square material until the attachments just barely touched the square material. Finally, I glued it in place and called it good! I used two pocket holes on the bottom of the platform to attach it directly to my wall. Now I can easily grab however many bench cookies and attachments I need with ease and return them to their little homes when done. The T-track table is extremely useful however the accessories were just lying around and really getting on my nerves. To organize these I decided to use a section of the T-track, which they are designed to fit into, to store them. I grabbed a track, slid on a couple of accessories, and then marked a cut line. I then cut them to length using a miter saw. I am only stowing two types of accessories on each T-track. This way I am not locking any accessories between other accessories forcing me to remove things that are not of use in order to get to what I actually need. Basically, I will be able to slide off what I need from either the right or the left. I grabbed some 3/4″ scrap wood and use my router with a 3/4″ square bit inside of it to cut a dado. I did not make the dado on center because I will be using screws to a attach this to my wall and need room for them. The tracks come with screw holes to attach to the wood. I would first use a self-centering bit to pre-drill these holes then use some small screws to attach the track to the wood. I located where I wanted it on my wall, pre-drilled a couple of holes, and then attached them permanently in place near the T-track table. Now I can slide the accessories on and off from either the right or left. From here I simply repeated these steps with all of the other accessories that I had. 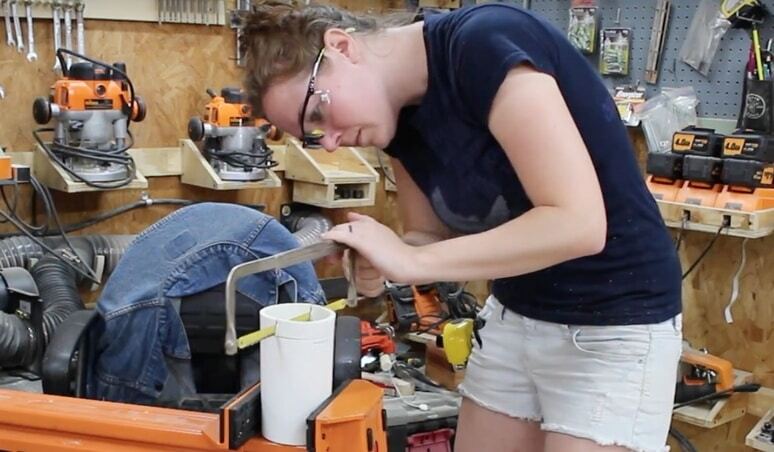 Even though all these projects are extremely simple, it makes a big difference in my shop. If you have a lot of small items just laying around your shop then I really urge you to take the time and make some dedicated homes. It doesn’t have to be complicated, expensive, or time consuming. I did these in a day and didn’t spend a penny.